يقع في Lake Eacham, Chambers Wildlife Rainforest Lodges إنه المكان الأنسب لاكتشاف اثرتون تبللندس و ما يحيطها. إن موقع الفندق الاستراتيجي، الذي يبعد 9 km فقط عن مركز المدينة، يسمح للنزلاء بالوصول سريعاً وبسهولة إلى العديد من الوجهات المحلية المثيرة. بالنسبة لمن يريد الخروج، هذه بعض المعالم السياحية المتوفرة للزوار Curtain Fig Tree, Mount Quincan, Yungaburra National Park. إن الخدمات الممتازة وحسن الضيافة العالي في Chambers Wildlife Rainforest Lodges تجعل إقامتك تجربة لا تنسى. يقدم الفندق واي فاي مجاني في جميع الغرف, واي فاي في المناطق العامة, صف السيارات, غرفة عائلية, مرافق للشواء لضمان الراحة القصوى لضيوفه. لقد جهزت هذه الإقامة الفندقية بعناية فائقة لتوفر مستوى عالي من الراحة. في بعض الغرف يجد النزيل تلفزيون بشاشة مسطحة, اتصال لاسلكي بشبكة الإنترنت (مجاني), غرف لغير المدخنين, تدفئة, شرفة/ تراس. يمكنك الاستمتاع بالأجواء المريحة التي تقدمها حمام سباحة داخلي, سبا, بلياردو, حديقة طوال النهار. مهما كانت أسبابك لزيارة اثرتون تبللندس، فإن Chambers Wildlife Rainforest Lodges هو الخيار الأفضل لإقامة مثيرة وممتعة. This will not be what you expect. The photos give a quite different view of what it is like. It is very neat & clean and very peaceful, but it is very remote. Lots of wildlife & serenity, but access is , or could be, a bit of a challenge without a 4X4 if the weather was bad. I would definitely stay here again, but not as a business stay. Saw lots of animals from our lovely wooden terrace in the heart of the rainforest. Brush turkeys, sugar gliders, bandicoots, striped possums, snakes......wonderful experience! Excellent for birds and wildlife. Knowledgeable and helpful staff. Good basic accommodation. Rooms well kept clean, beds so comfortable and for the price we paid. Excellent and so peaceful out there in the forest. I am definitely going back there again. It was a comfortable stay, very friendly staff and beautiful surroundings. Room was a little aged but had all you needed. Queen/King bed was sooo comfortable but toilet shower was small but adequate. Considering we travelled early January the temperature was wonderful due to the location. Great having Lake Eacham so close too. Would definitely recommend. We saw so many wild animals & birds - it was like David Attenborough on your doorstep! We were there at the start of the wet season so everything felt a bit damp but that is to be expected - to counter that we just used the little heater in the lounge to take the edge off at night. Rooms clean but surrounds looking tired. It takes nothing to cut the grass and clean up the gardens. Not s good impression. It was so quiet and peaceful! The pool was situated beside a room for reading and playing, it was tucked away just fat enough to be hidden. Lovely lodges. Great wildlife. Very helpful staff. The place was exactly as we had hoped. Peaceful and Quiet. We had thought that we would see more wildlife than we did. We did find the place not as clean as we would have liked. I pushed the couch to look for something and it was extremely dirty underneath. The kitchen cupboards were also greasy I pulled everything out and cleaned it before we unpacked. When we booked the picture and floor plan of our room indicated a spare bed however our room did not have that. perhaps a booking error on my part. Otherwise highly recommend the place as it was rustic and private and very close to Lake Eacham, Yungaburra, Malanda etc. We got a lot done with little travel time. Chambers Wildlife Rainforest Lodge was everything we could have hoped for and more. The lodge is set in a beautiful environment and I wish I could have stayed longer. Each morning we were able to sit out on our deck and enjoy our breakfast while Spotted Catbirds, Victoria Riflebirds and Lewin's Honeyeaters came in to eat fruit off our deck. They especially enjoyed the cut up grapes we put on the railing. At night we were able to see Striped Possum and Sugar Gliders come in for a meal in the lighted viewing area. Our hosts were able to also tell us about other viewing of rainforest wildlife in the area and we were able to see platypus and tree kangaroos in the wild. I would highly recommend this lodge to anyone wishing to get a true rainforest experience! 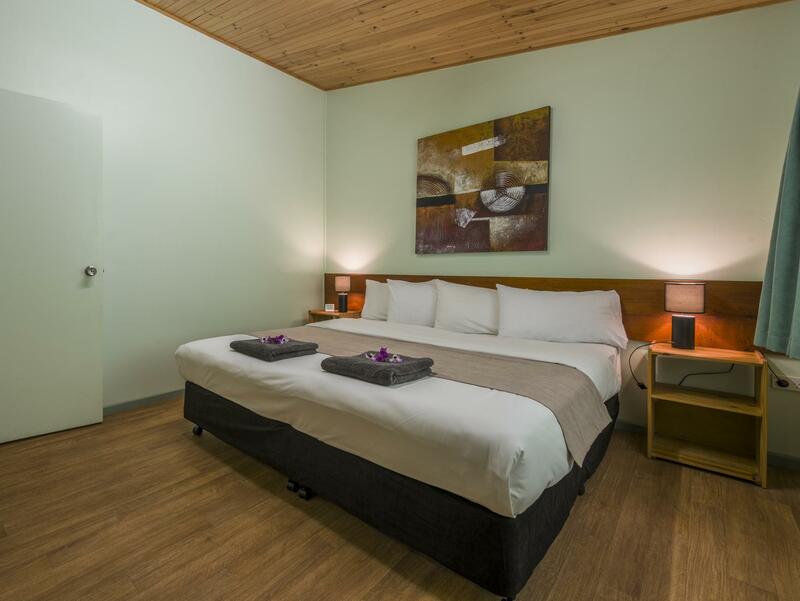 Good place to stay of you want to be near Lake Eacham, but don't expect fancy facilities. Dated, mouldy, damp cabins in the woods. Nice grounds, great wildlife, amazing location. Very basic cooking facilities and not many dining options nearby. We had a peaceful and relaxing time and were very welcomed by owner John. We went on bush walks and saw some of the wildlife at night which was unfortunately spoiled by some silly tourists with big cameras and flashes... Location is just perfect. The cottage -although- needs an upgrade on kitchen utensils, saucepans etc. Salt and Pepper would be nice to have in a self contained accommodation! Thank you, we would love to come back. It was a great place to stay, located in the middle of the rainforest. We got to see lots of different birds that came to our deck. Also the pademelon viewing at night was great. John was very helpful and friendly. My kids had a great time.